Award winning furniture designs inspire and delight folks each year as Doug gives us back our world with a vintage-Ricketts twist! Being the most stable of the painting team, my paintings touch on the energies and mythology of the landscape. The New Mexico areas trigger much of my inspiration…adobe and spirit. For 13 years, Carol and I have tried to see who could get a word in edge wise before settling down to our pastels in Lipscomb! "I'm what is termed a "Sunday Painter", I do it for my own enjoyment. The major critics are my family, who love everything I do, so I am QUEEN of "in house" artist. My paintings are wonderful, beautiful and everyone should have one!.....well, I hope you like them too. I say, Dance Your Story and be who you truly are.....which you will see in my art." "I am Carla Puentes from Spearman, Texas. The medium I use for my art is photography, sometimes combined with computer work to produce the oil painting effect. I practically grew up with a camera in my hand. I look forward to branding every year to return me to my childhood and to watch my children, nieces and nephews learn and share in their heritage and future. I capture all the moments I can with my camera." "Lonnie Cox and Night Life have been performing western swing “and other things” together for about four years. Lonnie Cox of Canadian plays guitar and provides vocals, as does Galen Lynch of Canadian who also plays a little lead guitar. Phil Ridgway of Higgins handles the bass, K.R. Henry of Ft. Supply, Oklahoma, plays lead guitar. Randy Starbuck of Shattuck, Oklahoma, is the drummer and Jimmy Young of Amarillo is the band’s fiddler." 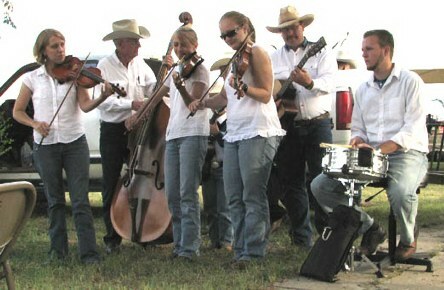 Texas Stardust is a five piece band specializing in traditional Texas fiddle and dance music. Influences include Bob Wills, Frankie McWhorter, Bobby Koeffer, Bob Boatright, and Joe Stephenson. As former members of Lanny Fiel and the Ranch Dance Fiddle Band they have traveled all over Texas and parts of New Mexico performing this unique music for dances, private events, and radio shows. Band members include (from left to right) Tracy Bohn, Dale Winders, Stacy Bohn, Kalli Burk, Daron Brown, and Matthew Hart. Stacy and Tracy Bohn are twin sisters from Shallowater, TX. They have played fiddle for ten years. Both are graduates of South Plains College where they played regularly with the college Celtic ensemble, County Hockley Ceili. They are currently employed in concert production at Miller Pro Audio in Lubbock, TX. Dale Winders, who plays bass for Texas Stardust, is from Dimmitt, TX. Dale played bass with Lanny Fiel and the Ranch Dance Fiddle Band. He also recorded and performed with Flatland Bluegrass and is still with the group today. Besides playing bass, Dale is Kalli's grandfather, and he bought her first fiddle when she was 11 years old. Kalli Burk, from Lubbock,TX, has played fiddle for twelve years and is a senior at Texas Tech studying for a Bachelor of Arts in music with an emphasis on Celtic fiddle. In addition to teaching private students of all ages the traditional Texas fiddle, she has also taught several summers at a Western Swing fiddle camp in Crowell, TX with Bob Boatright. Plainview native Daron Brown is also a graduate of South Plains College and has played guitar with a variety of artists and bands. Daron is a multi-instrumentalist, proficient in many genres of music. He also performs vocals, bass, steel guitar, banjo, mandolin, and fiddle. Matthew Hart, Texas Stardust's drummer and rhythm enforcer, has been playing drums for twelve years. His previous experience includes drumming for Benchmark, Catalyst, Shane Bernard, and playing percussion for the Lubbock Youth Symphony Orchestra. He has also played for several years in many praise and worship bands. Born in Ralls, TX, he now resides in Lubbock with his wife, Emily. 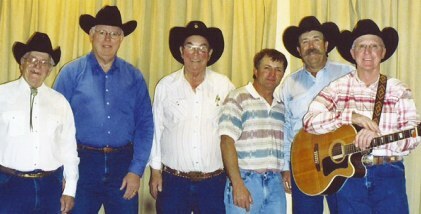 Texas in the Swing was formed in 1997. Since that time, they have played over much of Texas, New Mexico, Oklahoma, and Missouri. Their Specialty is Western Swing with some classic country, cowboy, and gospel music thrown in. 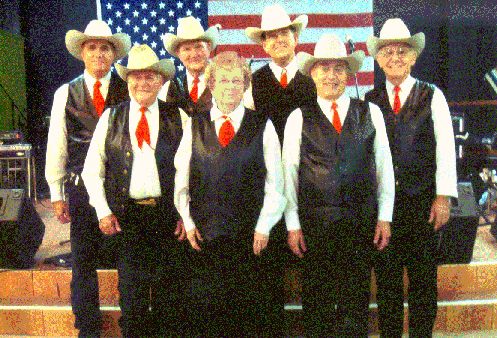 They have been featured performers at the Legends of Western Swing concerts in Wichita Falls and Snyder, West Texas Western Swing Festival, and since 1998 have been a featured band at the Great American Music Festival at Silver Dollar City in Branson Missouri. Jimmy Burson, the leader, is a rancher and former county judge from Silverton, Tx. He has been performing for over 35 years, doing western swing concerts, Cowboy events and gospel music. Other members of the band include Lucy Dean Record, Lockney, piano; Jimmy Young, Amarillo, fiddle; Lee Barlow, Canyon, bass; O.B. Barnes, Tulia, mandolin; Jim Burrell, Marshfield, Mo., steel guitar; and Don Long, Ponca City, Ok., drums. Texas in the Swing prides itself in being a “family friendly” band, playing music appropriate for all ages and welcoming everyone to their concerts.